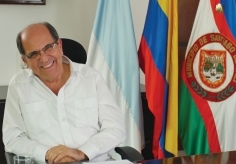 Rodrigo Guerrero, the mayor of Cali, Colombia, was the inaugural winner of the Roux Prize in 2014. IHME’s Director of Communications, William Heisel, asked him about the work that led to his nomination, what the prize meant to him, and his hopes for how the Roux Prize might spur more evidence-based decision-making in the future. Q: What were your first thoughts when you heard that you had won the Roux Prize? A: I was very surprised. I didn’t know how I had been nominated or selected. And I was very flattered that the Roux Prize judges had been generous enough to acknowledge the work that I had been doing. Q: Did winning the prize change anything for you? A: Absolutely. I have given interviews from time to time about violence in Colombia and what we are trying to do about it, but this took the idea of prevention of violence and made it international news. I have been contacted by media all over the world: Spain, France, New Zealand, Argentina. The Lancet wrote about it. The BBC broadcast a story about it. And I have been asked just recently to write about it for Scientific American. So now people who have never considered the idea that you can take meaningful steps to prevent violence in a community are paying attention. Q: Does media coverage have a meaningful impact? A: Let me give you an example. The president of Honduras read about my winning the Roux Prize in a news story in his country. He immediately contacted me and told me he wanted to learn from what we have been able to do in Cali. Honduras, as you may know, has been one of the most violent countries in Central America for many years. He flew me to Tegucigalpa to speak to his cabinet and to give a talk to some of the mayors of the major cities in the country. I tried to inspire them by saying that Honduras is where we were in Colombia 20 years ago. I said, “You are not condemned to a future that you cannot change. You can change the course of your future.” The government there is working with CISALVA, the research institute from Universidad del Valle, in Cali, that I helped form, to put in place some of the same metrics that we are measuring here to find the key drivers of violence, to look at the total disease burden from violence, which includes both deaths and injuries, to isolate the geographic areas that are experiencing the most violence, and to identify short-term and long-term solutions, ways to address the risk factors as we normally call them, to make communities safer. Q: What have been some of the most successful solutions in Cali? Q: And how have things changed – if at all – since you returned to the mayor’s office in 2011? A: The situation in Cali is very different than it was 20 years ago. Since I left office, the causes of violence have actually changed dramatically. When I returned, I analyzed the situation and found that two-thirds of the homicides in the city could be linked to organized crime, to the drug gangs. There was planning involved, and many of these killings were actual executions between rival gangs or within a gang. This was not the case with the interpersonal conflicts ending in homicide that we were trying to stop in the 1990s. Q: This must have been déjà vu for you. Except now it really was the drug cartels. What was your response this time? A: The beauty is that we have a method based on applying a burden of disease approach that allowed us to make comparisons. We knew this time that the solutions would require more help from the outside. So we approached the police in Bogotá and the central government of Colombia and said we needed to apply a similar strategy to what Colombia had done in the 1990s to fight the drug cartels. There was the need to spend time gathering information on organized crime groups or gangs throughout Colombia, particularly in Cali and neighboring areas, identifying the groups and individuals responsible, gathering evidence so as to be able to stand trial and neutralizing the groups. The priority became the anthill, not the ants. In addition to that, we are making significant investments in improving the quality of public spaces – what has been called the broken window effect – in improving educational activities and training, in income generation programs for the youth, and in providing people with a sense of security that they didn’t have before. Q: This time the results were probably harder to come by, right? A: They were. It was very hard work and required a lot of coordination. And the results have been impressive. We just recorded in February the lowest homicide rate in Cali since the city started keeping reliable records in 1992. It’s a testament to the method that we have been using to lower the disease burden related to violence. We can trace the successes we have had very clearly to the areas where the gangs have been neutralized. The method is operating well. The situation was very different 20 years ago, but the method continues to work. Q: In addition to your work with Honduras, have there been other opportunities for you to improve violence prevention in other areas? A: To be honest, I have not even been able to meet all the requests. Being the mayor of Cali is a very busy job itself, and our work here to lower the rates of violence is far from finished. But I have had some great opportunities to share what we have learned so far. I spoke with the leadership in violence and injury prevention at the World Health Organization and explained to them that we need better, more standardized, and comparable indicators for the types of violence and effects from violence. Something equivalent to the International Classification of Diseases, which the WHO manages and has been essential for the success of public health efforts. We need to take that a step further with violence. We need more metrics that are international in their application, that are standardized, and that can lead to meaningful comparisons across time and place. We need to provide policymakers and politicians with better measurement tools. I also was part of a panel convened by the World Bank President Jim Kim that was broadcast and translated for all of the World Bank offices internationally. Q: What was your message to the World Bank offices? A: The World Bank is uniquely positioned in that it has people stationed in some of most challenging economic and social environments, and it also has the resources to make tremendous change with the way it provides loans and makes investments. So I put a lot of stress on the idea of preventing violence both to lower the disease burden from deaths and injuries but also to protect young children from the ripple effects of violence. There is still a largely unknown burden of mental health disorders from the stress put on children who are witnesses to violence or who lose a caregiver because of violence. That has a big toll on a society. And we can do something about it. I’ll be leaving for London soon to speak at a conference about sustainable cities, and I will be bringing a similar message there. Q: You were celebrated at the Roux Prize award ceremony in New York in 2014, but you declined the actual prize money. 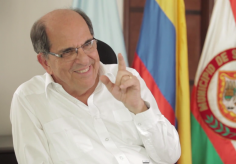 Instead, you asked that the $100,000 be given to the Universidad del Valle in Cali. What will happen to that money? A: Our hope is that it will be used to create a new generation of decision-makers and politicians who can measure the greatest challenges in their communities and create solutions. I am working with the Universidad del Valle on getting another $200,000 match for the prize and possibly more than that. I’m also working with the central government agency in charge of education to see if I can secure some funds there. The goal is to create a fund for faculty members in Colombia to be trained in public health and epidemiology so that they can then train the future policymakers and politicians of the country. The main strategy is the use of science in policymaking: data gathering, making decisions from the data, and measuring the impact of those decisions. Q: Looking back on the time since you won the Roux Prize, do you think the award has changed anything? A: It has had a powerful impact on the prevention of violence worldwide. More people are now talking about violence in terms of prevention, not just shrugging their shoulders as if it were something that is inevitable, something that all cities have to endure. Most people I talk to are truly surprised that you can break violence down and make it preventable. They didn’t know that was something that could be done. I credit the awareness created by the Roux Prize for changing the dialogue around violence from one that was despairing to one that is now focused on the science of measurement and prevention. With politicians that is key. If they think they can change the course of a problem, they will take it on. If they think that it is a problem that will never go away, they will ignore it.